This is a recipe by well known home brewer Mike McDole (aka 'Tasty' on the forums he frequents). It's a recipe that got some great publicity when it took gold at the 2004 National Homebrew Competition (NHC) - it was entered under category 23 Specialty Ale. 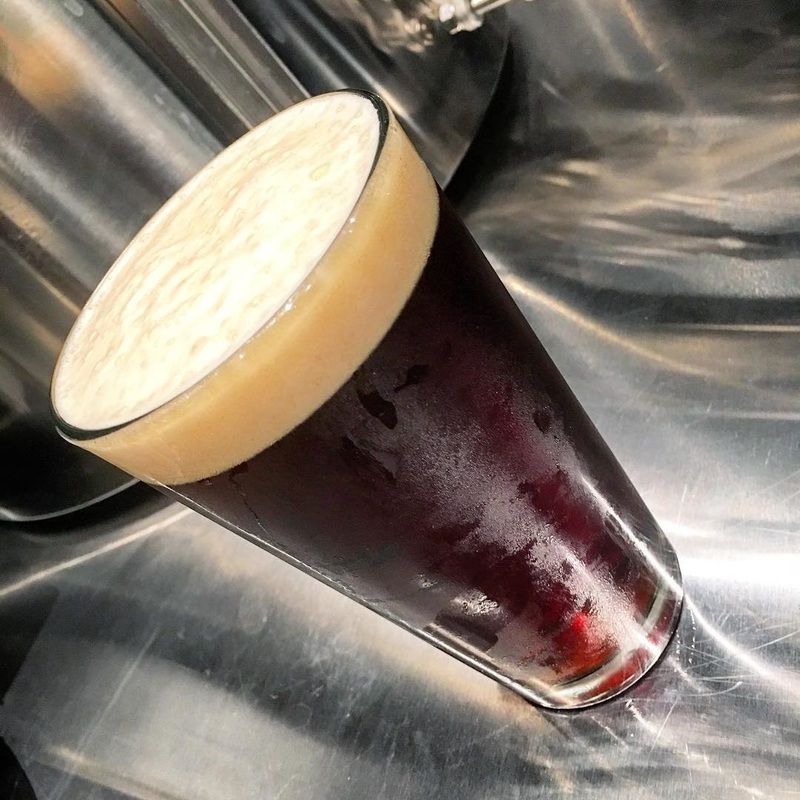 Some may want to call it an American Brown Ale but is a bit outside the numbers for that style because it has slightly too much hops and alcohol. You could call it an Imperial American Brown Ale I suppose (if that category existed). UPDATE: The new 2014 BJCP Guidelines include a category 21B called "Specialty IPA" which covers White, Black, Belgian and other varieties, as well as allowing, like all categories, strength variations (Session, double, Imperial, etc). According to both Gordon Strong (BJCP President) and Tasty, under the new Guidelines this beer would be "Category 21B - Specialty IPA - American Brown Session IPA". It's a beer that I had heard about for years but never got around to making... I finally brewed it last weekend (Oct 2011). I couldn't resist and sampled a bit yesterday and it's coming along wonderfully! If you like hoppy American style ales, this is one you definitely have to try. A nice fall beer. JANUARY 2013 UPDATE: I've brewed this beer numerous times now and it's one of my favourites to keep on tap. The malt and hop flavours work perfectly together. FEBRUARY 2014 UPDATE: I brewed this beer again in the fall of 2013 but but this time I'm serving it using a beer gas blend (70% nitro / 30% CO2) instead of straight CO2, pushed through one of my stout faucets to get a nice creamy head and close to flat beer. Absolutely wonderful. I enjoy it a lot more than on regular CO2 so this one's always going to be served this way from now on. *If using pellet hops break them up before adding them to the mash, otherwise they will clump up and you won't get much out of them. I find the easiest way to do this is to add the hops to 2-3 cups of hot strike water in a bowl and let them soak for a few minutes to allow them to break up. Then stir until it's an even soup (no clumps) and dump and mix well into the mash. You may find that your mash will foam up a bit more than usual with hops in there. This is normal. Boil for 90 minutes. Lid on at flameout with 0 minute hops, start chilling immediately. Kal, You've read my mind. One of the local Micro's (the one who gave me the wedge wire) makes a Cascadian Brown Ale, a very hoppy brown, and it's delicious. I decided I wanted something like it for a fall/winter beer, so that was my plan for my next beer. This is one of the recipes I was eying up. I think you've made up my mind for me. Janet's Brown is a great recipe, if you like hoppy beers! Everyone I know who has brewed it has received rave reviews. I just added the dry hops and tasted a sample beforehand... I can see why everyone likes this one! How is it Kal? I'll be dry hopping mine on tuesday. Really excited. I just put a keg of it in the chest freezer 2 days ago (had to wait for a spot to clear up). I'd say this one's a definite must brew again in my books if you like american style hoppy beers. Had the first bottle of this last night. Then the second, then the third.... This is some seriously good stuff. I want to brew it again right away, just so there's no down time between batches. Fast forward a few months.... the first keg is done and the second was placed in the serving freezer about 2-3 weeks ago. This is a really nice beer that I plan on keeping in circulation. It almost has a slightly 'Porter' taste to it but with an American slant. it's citrusy/fruity hops paired with a rich malt background of chocolate, roast, and caramel flavours and aromas. While it's hopped as high as many America IPAs it doesn't taste it because of all the malt backbone. The roast is very subtle. Everything you read says don't combine roasty with hoppy but for whatever reason the levels here are subdued enough that it just works. I can see why this beer has won many awards. What efficiency level is the recipe listed? Hmmm, seems I missed a couple of lines. I've added it now. It's 95%. I also noticed that I had 1.066 OG. That should have read 1.068. The ABV went up very slightly too. I made this beer again ~2 weeks ago and last night I racked out of the primary after dry hopping (1 week ferment, add dry hops to primary, leave 1 week). The beer's now in a couple of 5 gallon glass carboys with gelatine. (My 'brite' tanks). They'll stay there for ~2 days and then kegged. This beer is fantastic as usual. Anyone else making it recently? Kal - Just read the recipe for the first time and I think this will be one of the first few batches to brew on my new setup! Here's hoping mine comes out! Like most American Ales it's an easy beer to make. Just make sure to let it ferment out properly. I usually leave it for a good 7-10 days at around 66F ambient and then add the dry hops directly to the primary and leave another 7-10 days, then rack to a secondary to clear. Leaving the beer on the primary yeast this long always helps clean things up and attenuates the beer properly. The biggest mistakes new brewers make is trying to do things too soon (like racking) thinking that they need to take some action. 99% of the time if you think there's some issue during fermentation, the best thing to do is simply wait. A secondary fermentation is not required and will do more harm than good. Don't rush it. Thanks for the tips Kal - much appreciated. I'll likely brew this batch as the first one to go into my 15 gallon plastic conical after I get it setup, and then I'll be sure to be patient! I'm brewing this today for the second time using Wyeast 1056. It's a perfect blend of malts and hops and for a pretty big beer it's very enjoyable as well. I sat on this beer all summer and when I got back from my assignment(Pittsburgh, PA) I was able to enjoy this as one of my favorites and will always be in my cooler. If you haven't tried this beer your missing something pretty darn special. What would be a good replacement for hops, if I didn't want it to be a real hoppy beer? 504bar.com - "Have a drink on us!" It's not the hop choices that make it hoppy, it's the amounts. The types of hops make it decidedly american (as do the choices of grain and yeast). You could cut the hops in half or so. Depends whether you mean hop flavour, aroma, or bitterness too when you say "hoppy". If you don't like hoppy beers, I would probably make something else. Start a new thread about what types of beers you like and maybe someone can offer recipe suggestions. Kal - I'm about to brew my second batch of Janet's, and I just had a couple of questions for you regarding the gravity values shown in the recipe. I'm trying to work through this based on my results to date showing about 85% mash efficiency, so I was comparing to yours. Anyway you show a 95% mash efficiency with 13.9 gal pre-boil and 12 gal post-boil. Using the shown grain measurements I come up with 67.7 gravity points maximum from the five grains for the 13.9 gal wort collected (using 38, 37, 32, 34, 28 max PPG respectively for each of the 5 grains in order in the recipe, from Palmer's online table). With a 95% mash efficiency that makes the pre-boil gravity 1.064 points. Assuming a boil down to 12 gallons I then get 1.074 as the post-boil gravity which is a wee bit higher than the 1.068 shown in the recipe. Can you explain how you got the numbers you show, or are those from morebeer.com? If I run through it again using 85% mash efficiency for my system I get 1.058 pre-boil OG and 1.067 post-boil OG, which would be just about perfect relative to the 1.068 OG of the recipe. I'm just trying to understand this process a bit more thoroughly - never used to care back in the "old" days brewing with gas and mashing in a cooler. We got what we got and we drank it! Errr, wait a second. It's supposed to be a 90 minute boil, not 60. I fixed the recipe in the original post to call for 90 minute boil. The grain amounts were right. You'll need to start off with more pre-boil. 14.9 gallons in my case but boil off rates are different for each system. Sorry about that. The grain percentages and the OG were right however. That's all that matters. With any recipe you play with the grain amounts until you get the target OG you want for you system's efficiency for the given boil duration. The second time I made it I reduced the grain amounts slightly to account for a 60 minute boil (I didn't see the point of 90 as per the original recipe, but I wanted to stay true the first time I made it). The result seemed identical to me from what I remembered from brewing it the first time. Looking around the interwebs, for this popular recipe some call for 60 mins boil, some for 90 min. I'm sure either will give great results. (Both have for me). No worries! I just wanted to make sure I can still do math! My first batch on my new system was this recipe, and in spite of several miscues by me that first time it still came out great. I'm having a pint now in fact.